Veronica and her veil are significant to Christians and are revered by the Catholic Church. Veronica’s veil is known as one of the most valued Christian relics. The cloth is also known by Roman Catholics as the “sudarium”, “volto santo”, or “vernicle”. The Catholics remember the story of St. Veronica and her veil by making it a part of the Stations of the Cross, a Catholic tradition which tells the story of Jesus’s crucifixion. The Catholic Church honored Veronica by naming her a saint. They also celebrate her memory on the feast day of St. Veronica. Catholics and other Christians relate Veronica to a woman in the Bible named Haemorrhissa, who was cured by Jesus. According to the Bible Prob web blog post on the history of the religious relic, Pope Boniface VIII had the relic brought to St. Peter's Basilica in Rome in 1297. It was first displayed on the first Holy Year in 1300. During the remodeling of St. Peter’s Basilica, the relic was stolen. In 1616, Pope Paul V prohibited copies of the veil to be made. Pope Urban VII had all copies of the veil destroyed in 1623. Four centuries after the original relic was stolen from the Basilica, Father Pfeiffer, professor of Christian Art History at the Pontifical Gregorian University claims to have found the orginal veil that was stolen in a monastery located in Italy. Today, the only representation of Veronica’s veil remains at St. Peter’s Basilica in Rome, in an old, fragile frame with cracked glass. It is located next to a marble statue of St. Veronica in the Basilica. Badde, Paul. “Veronica’s Veil Found.” CatholicCulture.org. Trinity Communications, n.d. Web. 16 October 2012. Dégert, Antoine. "St. Veronica." Newadvent.org. Robert Appleton Company, 1912. Web. 14 October 2012. Giuliani, Fr. Giovanni. “Guide to Saint Peter's Basilica.” St.PetersBasilica.org. Web. 16 October 2012. “Veil of Veronica-history of” BibleProbe. N.p., 3 Sept 2006. Web. 16 October 2012. “Veronica.” Bloomsbury Guide to Art Credo Reference. Web. 13 October 2012. 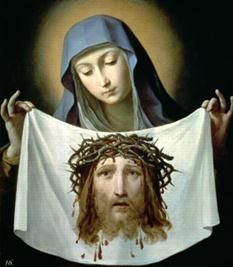 A post containing information on the history of St. Veronica’s veil. An original article by Paul Badde about the former and current location of the religious relic. This webpage contains pictures of St. Veronica’s statue in St. Peter’s Basilica in Rome and gives background information on the legend of the veil and its symbolism in the church. Shows a picture of the Catholic Church’s sixth station of the cross as St. Veronica wiping the face of Jesus while He is crucified on the cross.